AC/DC is still going strong with new releases, as this week, we look at their album Ballbreaker, from 1995. The lineup of the Young brothers (Malcom and Angus), Brian Johnson, Cliff Johnson, and Phil Rudd had been on previous AC/DC releases. And, like these releases, they still rock in true form, as past albums. Yet there were no big hits from this particular album, the album still holds strong, having solid tracks, and keeping the hard rocking sound that only they can provide. As usual, there are some great rockin' tunes here: "Hard As A Rock" could easily have been a radio hit, as it leads off the album with a solid punch. "Cover You In Oil" is another great tune. "The Furor" is good, maybe not as great as the previous two tracks. "Boogie Man" has a more slow blues feel, something we don't normally hear from this band. Then there's your typical AC/DC Rock on "The Honey Roll." "Burnin' Alive" gets a good groove going. And like "The Furor," "Hail Caesar" is another "good" track, likewise "Love Bomb" and "Caught With Your Pants Down." "Whiskey On The Rocks" is another typical AC/DC Rock track, yet it slows down the pace, music wise. And lastly, the title track is another great AC/DC track. Not a bad song on this album, Ballbreaker still keeps AC/DC in top form. Sure, their albums have been awesome, yet there weren't any radio hits from my knowledge on this album. Yet on the research, "Hard As A Rock" was the first single (and obviously a good one). The second single was "Hail Caesar," and the third was "Cover You In Oil" (another obvious choice). Although these tracks may have received the airplay, I don't recall it. Most likely because there is only one radio station in Chicago that does play their music on a regular basis, WLUP. Maybe it's because today's music (Rock, Pop, Country, or "whatever") hasn't been outstanding in many years, I really don't listen to local radio stations that would normally provide the newer music of today. Yet I do remember AC/DC's next album after Ballbreaker, 2000's Stiff Upper Lip. The title track I do remember hearing on local Chicago radio. Despite that being said, there is no doubt that AC/DC's music is still a force. Loved by many, they still attend their concerts. And although current lead singer Brian Johnson rocks out his best, many of us still remember the original lead singer, Bon Scott. Some say he was the better of the two singers. Bon Scott died at the time the band was beginning the recording of Back In Black. Had Bon Scott lived, Back In Black most likely would have had his distinctive voice. Where most bands would break up after a prospective band member's death, AC/DC continued onward, and to this day, still records some fantastic albums. Guitarist Malcom Young stepped down and retired from recording and performing, due to ill health. And again, as another dominant member leaves the band, they still continue on. The current rhythm guitarist who replaced Malcom Young is now Steve Young. Steve is the nephew of Angus Young, and like the two brothers Malcom and Angus, AC/DC keeps the guitarists in the family tree. 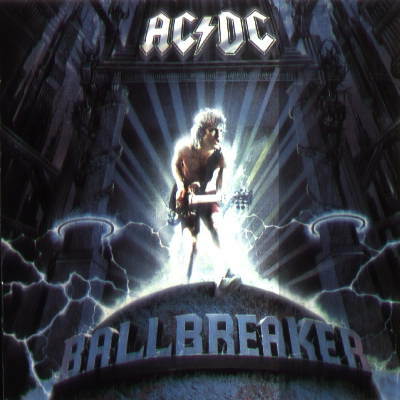 Ballbreaker is another enjoyable album, from a band that has been around since 1973. Although they've had their personnel changes (changing drummers -- Phil Rudd had bad experiences with the law), and Bon Scott's death. Still, AC/DC still kicks it in gear, and although changes do occur, they still rock hard, and satisfy the hard rock fans' appetites for great Rock & Roll. © WSVNRadio.net. All rights reserved. Review or any portion may not be reproduced without written permission. Cover art is the intellectual property of EastWest/Atlantic Records and is used for reference purposes only.